Who we are: We’re Build a Beast fitness solutions, a complete fitness company aimed towards helping Corporations, apartment communities and retirement communities create healthier employees (or residents), increase their profits and productivity through our onsite fitness classes. What we do: We know that healthier employees means increased productivity in your work place (less absenteeism). It also means less sick days taken so you’re able to capitalize on your profits as a company (more Presenteeism). 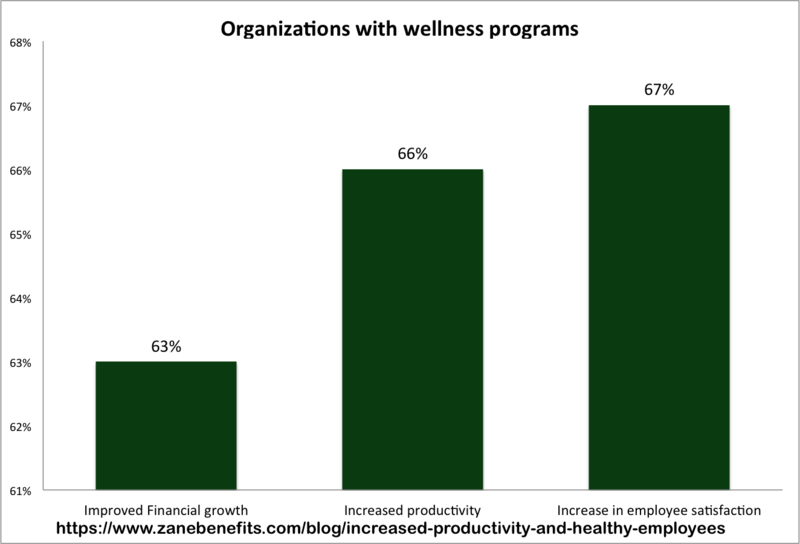 Through studies as you can see on the graph, companies that offer wellness incentives create happier employees so your employee retention rates go up! 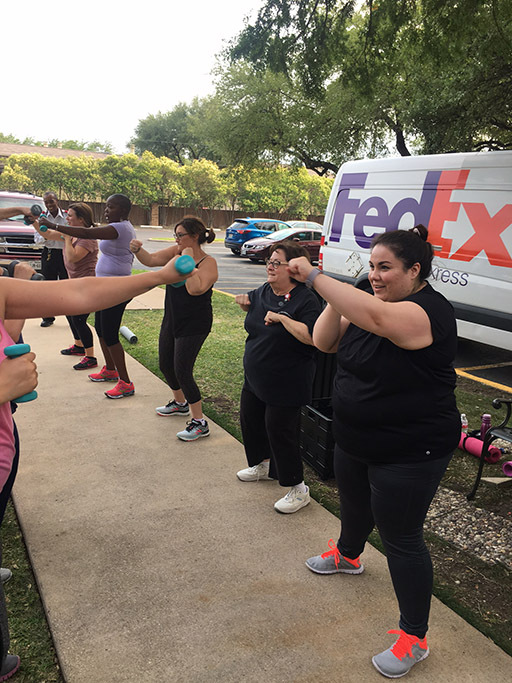 We do this for your company through our onsite fitness classes (total body, Yoga, Zumba, Pilatees and more) to your location. Our classes are 45min-1 hour long and they are for all fitness levels. Along with fitness classes, your employees have the option of receiving a personalized meal plan through our certified nutritionist. Finally we do monthly health seminars to engage your co-workers with their health. Book your FREE 2 sessions today or contact us now to see how we can help your company! BOOK 2 FREE SESSIONS NOW! We know that you or your employees are unaware of what maybe delaying your fitness goals or what is harmful to your health. 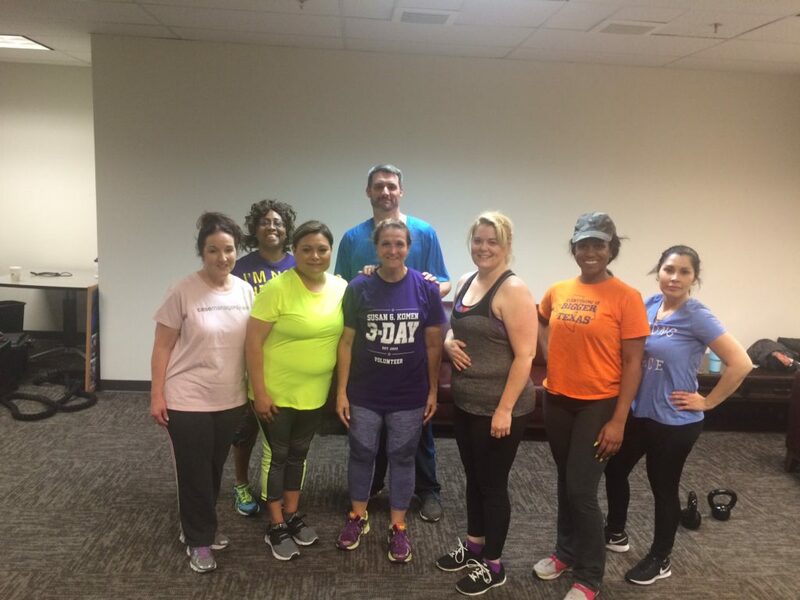 Also we know that even though our workout plan is benefiting your employees, there are still a lot of employees that are missing out because they haven’t been invited to our class on site or because they don’t know much about what we offer your company. That’s why we do monthly health seminars! For you to reach your health goals is takes 3 key components: diets, workouts and rest! We provide 2 of them, which are the workouts and the diet. For your first month, everyone who registers for class will receive a complimentary meal plan tailored towards their fitness goals. Whether that’s weight loss, muscle gain, or maintaining what you already have, we have the meal plans just for you. Also with our fitness classes, we provide personalize workouts that are tailored to each participants goals. We know that sometimes people can’t do enough classes to meet their goals, so we create workouts for your employees to do on their own in order to reach their fitness goals. Everyone has the opportunity to get an individualized workout plan, that’ll tell them what exact workouts to do and the proper form to reach their goals. 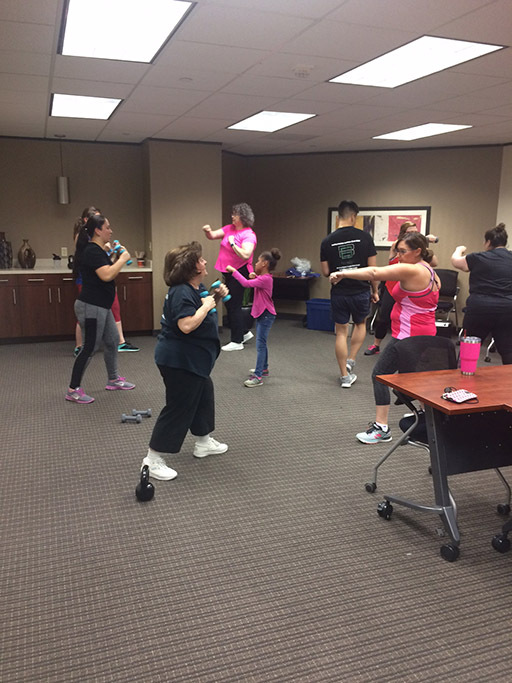 We offer your company our on-site fitness classes for as many times and many days a week as you like. Our classes are for as many as 40 people or more and as little as 2 people. We know that companies like you strive to always give something to your employees to show your appreciation for them and their daily hard work. One of the most important gifts you can give your employees is an opportunity to achieve optimal health. A thorough on site review of current employee health practices, monthly coaching, health tips and games that will facilitate camaraderie and teamwork among your employees. Weekly “10-10-10” workouts that are open to all employees. We also offer customized fitness programs that we can tailor to your specific wellness needs. Once we evaluate your workplace and meet to discuss your options we can put together a fitness plan that works for your company. Convenience: For both you and your employees, so now they don’t have to travel far to go to a crowded gym, instead they can work out on site. One of the biggest compliments we get is that, people have NO EXCUSES to not workout and become healthier because we come to them. Higher retention rate for you: Corporate wellness programs also contribute to the enhanced retention of key employees. Companies that implement wellness programs normally experience a much lower rate of employee turnover. Reduction of employee injuries: You will experience a reduction in employee injuries, illness, absenteeism and healthcare costs, as well as an increase in employee retention and productivity. Assuming responsibility for establishing a healthy working environment allows everyone to enjoy the benefits of corporate wellness. The bottom line: is you should take advantage of the benefits of corporate wellness. Make it a goal to implement a program as soon as possible – don’t wait until most of your employees are stressed, sick or applying to other jobs. 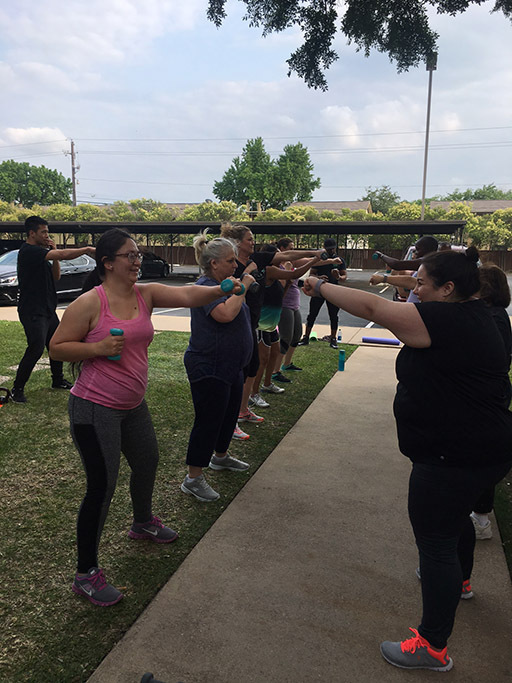 Through years of experience with professional clients, BaB Fitness Solutions owner “Dubs” Wilkins has created a culture of training that is unique, effective, energetic, and perfect for Dallas’s corporate settings. 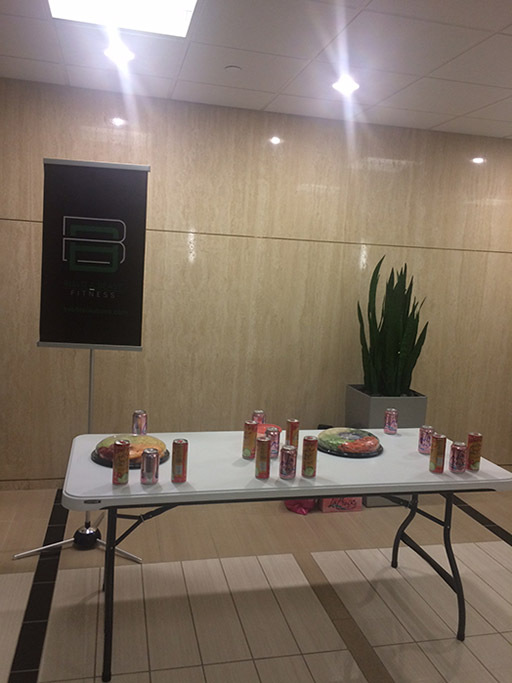 This model includes a daily fitness class utilizing a predictable and high energy workout model, office-wide competitions and rewards, and a carefully orchestrated office health overhaul to help create the healthiest environment possible for your employees, while saving you money on healthcare costs.